Jamal Murray scored 21 of his 24 points in the fourth quarter, and the host Denver Nuggets rallied from down 19 to beat the San Antonio Spurs 114-105 in Game 2 of their Western Conference first-round playoff series on Tuesday night. Nikola Jokic had 21 points, 13 rebounds and eight assists, Gary Harris scored 23 points and Paul Millsap had 20 for Denver. The Nuggets tied the series 1-1 and ended San Antonio’s seven-game playoff winning streak in Denver. DeMar DeRozan scored a playoff career-high 31 points and LaMarcus Aldridge had 24 points for the Spurs. 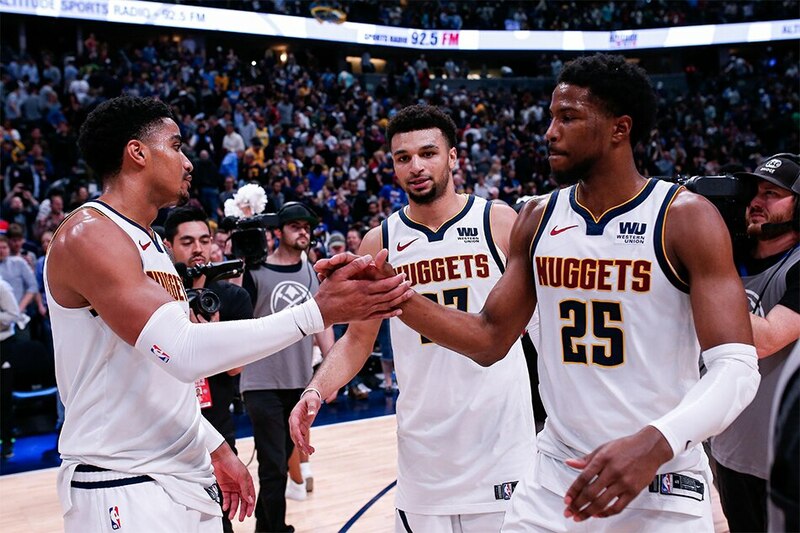 The Nuggets struggled to make shots deep into the third quarter but found their rhythm in the fourth quarter by hitting nine of their first 11 field goals in the final period to storm into the lead. The Spurs led 95-90 when Millsap converted a three-point play. Murray, who missed his first eight shots, got hot. He hit five straight shots in the fourth, including two straight and a pair of free throws that gave Denver a 99-97 lead, its first since 17-16. After DeRozan tied it, Murray hit another shot and then a free throw off a technical on San Antonio coach Gregg Popovich to give the Nuggets a 102-99 lead with 3:41 left. Denver was ahead 104-101 when Murray drained two 3-pointers to make it 110-101 and the Nuggets closed it out. The Spurs led by 10 at the intermission and Denver cut it to seven early in the third quarter. The Spurs went on a 17-5 run, capped by Rudy Gay’s three-point play, to go up 78-59 with 4:28 left in the third quarter. The Nuggets went on a run in the last 3:34 to get back into it. Down 80-64, Jokic hit a floater, Harris scored off a steal and then hit a 3-pointer to cut it to nine. After each team missed, Malik Beasley hit a 3-pointer and Murray split a pair of free throws to cap an 11-0 run. Aldridge hit a pair of free throws to stretch San Antonio’s lead to 82-75 heading into the fourth quarter.